Shares in one of the UK's largest mortgage lenders, Northern Rock, have fallen 32% after it had to ask the Bank of England for emergency funding. But experts and officials insist that Northern Rock, which has £113bn in assets, is not in danger of going bust. 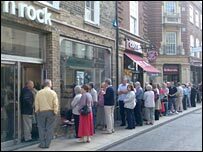 Despite the reassurances lines of customers formed outside many Northern Rock branches around the UK. What if a bank goes bust? Other bank shares fell, with Bradford & Bingley, Alliance & Leicester and HBOS down nearly 8%, 7% and 4% respectively. House builders were also hit, with companies like Persimmon, Taylor Wimpey, Bovis Homes and Berkeley Group falling around 6% and more. The London stockmarket's benchmark index, the FTSE 100, at one point dropped more than 2.2% before recovering during the afternoon. The index closed at 6,289 - a loss of 74 points or 1.17%. Northern Rock said that its profits for 2007 would be hit, but that it remained solvent. Speaking on BBC Radio 4's Today programme, Chancellor Alistair Darling said: "The problem here is there is a lot of money in the system but they are reluctant to lend it to each other at the moment." Mr Darling said that "in order to create a stable banking system, the Bank [of England] steps in and it makes facilities available to the Northern Rock." "Northern Rock can draw on them when it requires, but it means it can carry on trading, people can use their accounts in the normal way, they carry on making their mortgage payments in the usual way, Northern Rock will be able to carry on its business." Angela Knight, chief executive of the British Bankers' Association, said that anybody who was "either a saver with Northern Rock or has got a mortgage... can be absolutely confident that they have got their money with or they have borrowed from a very sound financial institution." All the calming words did not stop some Northern Rock customers moving some or all of their money to accounts with other banks. Several customers showed BBC reporters slips that suggest some did withdraw sums of £100,000 and more. Dozens of Northern Rock customers have contacted the BBC to complain that the bank's website was inaccessible, while all the bank's phone lines were jammed. The emergency lending facility to Northern Rock was agreed by Mr Darling, on advice from Mervyn King, governor of the Bank of England. Northern Rock chief executive Adam Applegarth said that it had not yet borrowed any of the "unlimited" funds available. He urged customers to remain calm, and stressed that it was "business as normal". However he indicated that it may, in future, be more expensive worldwide for institutions to borrow money, and that in turn could mean that mortgages generally become more expensive. The decision for the Bank of England to become the "lender of last resort" is extremely rare - and also comes after consultation with the Financial Services Authority (FSA). It is an unlimited facility, with interest rated at a "penal rate" of more than 1% above Bank base rate. To obtain the money, the Northern Rock will have to deposit some of its customers' mortgages as collateral, which are regarded by the Bank of England as sound. In a statement, Northern Rock said it had "agreed with the Bank of England that it can raise such amounts of liquidity as may be necessary by either borrowing on a secured basis from the Bank of England or entering into repurchase facilities with the Bank of England". "On the assumption that the current conditions remain until the end of 2007, there will clearly be an impact on Northern Rock's 2007 asset growth and, therefore, on profits." An FSA statement said Northern Rock "exceeds its regulatory capital requirement and has a good quality loan book".